We know that the Fiji Pensioners can never trust him, he is the perpetrator of the decree that deprived Fiji pensioners of their basic civli rights and their pension entitlement. He directly deprived them of the right to appeal to the judiciary for justice. This man is now appealing to people to work with the government, a government controlled by him that did not hesitate to steal from the weakest members of our society. The measure of a government or a society it how it treats its weakest members including the elderly.. 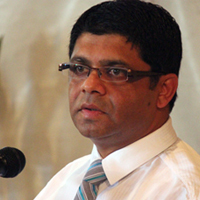 In this, the current Fiji administration now fully controlled by this man has failed miserably. Can it be true, has this man really taken total control of Fiji? He has certainly managed to place all his friends and confidants in positions of power, which gives him an extreme level of control. It is said his office drafted the replacement constitution and ensured it gave him virtually unlimited power. It is said he has at least 50% of the media constantly promoting him, which equates to him promoting himself. 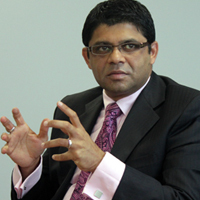 It is said he cleverly manages a schedule for the Prime Minister which ensures Frank is constantly out of Fiji, thereby allowing his office to have total control over 14 Ministerial portfolios. It is said he is allowed total control over government (tax payer) owned organizations/bodies; also in breach of corporate laws and standards has not published the annual accounts of Air Pacific for the past three years. 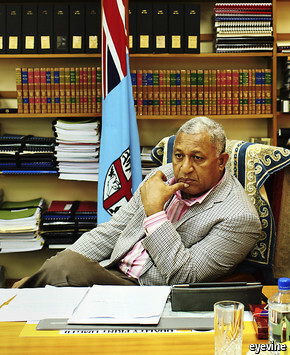 It is said he has put severe constraints on the “Rule of Law” in Fiji, due to all the decrees he has promulgated. It is said that his greed for power and money will result in the downfall of the current government should there ever be free and fair elections. Wake up before it is too late Frank, your most favoured Minister is on a rampage to satisfy his addiction to power and greed. You have allowed him too much rope Frank, he has already driven a wedge between yourself and your former supporters, indeed even your comrades in arms are appalled by the latest maneuvers of this Minister. Your hatchet man is no longer satisfied with crumbs from the table, he wants the whole cake, and the truth is he already has most of it. People are saying you are no longer in control Frank, they are saying that your most favoured Minister is running Fiji. making all the decisions and they no longer feel that they can vote for you if there is an election… Frank please wake up. People are saying that your most favoured Minister is a cold, calculating, compassionless vindictive individual, who is handing out special favours to his friends at the expense of the nation, they are saying this man will bring you down because you continue to allow him to manipulate you…… Frank please, please wake up. Look to history Frank, Caesar trusted Brutus above all others and Brutus lured him to his death. Caesar should have listened to his wife, for she begged him not to go when Brutus called. Please wake up Frank, there is still much that needs to be done, there is still much you must do for Fiji…. Once again we have government vehicle GP 256, driving down Bau Street this morning at approximately 10.00 AM (4/7/13) at great speed, so that we other road users had to literally veer off the road whilst he screamed down it, blinking lights, tinted windows and all! I have complained previously on 12/4/13 about the driver of this same vehicle, doing exactly the same thing down the same road at approximately the same time. I don’t know who the hell he thinks he is, or who the hell the ‘important’ person he is driving for thinks he is, but it is high time something was done about both of them, before someone gets hurt or killed. He and his passenger also need to be reminded that the vehicle he continues to drive so recklessly and so dangerously, without consideration or thought for other road users is paid for by us, the taxpayers. As well, his salary as well as the salary of his ‘important’ passenger is also paid for by us, the taxpayers. Just in case their heads are so swollen, they have forgotten!